To prepare for First Reconciliation and First Eucharist at Holy Spirit, we ask that your child is at least in 2nd grade and has already completed at least one full year of religious education (either in a parish program or at a Catholic school). 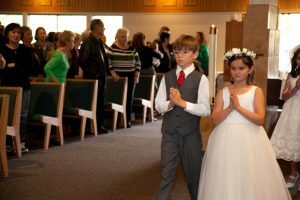 The preparation for these sacraments is separate from the classroom and runs concurrently with your child’s second year of religious education. The program culminates with the celebration of your child’s First Reconciliation during Advent and with the celebration of your child’s First Eucharist typically during the month of May. For more information, contact Merry Reardon at 408-997-5112 or mreardon@dsj.org. Registration for 2019-2020 Sacramental Preparation is now open. Our Photography Ministry will use their special gifts to capture all the moments of your child’s First Eucharist Mass. They will also take family photos and photos with the priest after Mass. Since they have worked extensively with the priest and the liturgist, they can often capture images and memories that no one else can. For additional information, please contact Walter Seepersad at 408-250-0736 or walter@holyspiritpictures.com.